Chineme, 22, one of the participants from the Voice of a Generation tour who we met in Sheffield gives us her views on the immigration debate in the UK – and the effect of the government and media on young people’s perceptions. According to statistics released by the Home Office, just fewer than 13 million immigrants were granted entry into the UK from 1999-2008. With the total population of the UK around 60 million according to the Office for National Statistics, immigrants in Britain accounted for 7% under the New Labour government. Contrary to what British headlines in the news would have you believe, the vast majority of immigrants at the time were coming from the Americas; more than double that of immigrants coming from European nations. These trends are continued in 2014 where major increases seen in granted work visas are from countries in Asia, Australasia and the Americas. The largest decrease in the number of work visas granted are from Africa and the Indian subcontinent. The problem with statistics about immigration is that they are non-specific, accounting for the number of passengers coming into the UK. This means that the data does not consider those who may have made several journeys into the UK on different visas. Statistics about immigration often distort the reality of migration as a social and historical phenomenon. Historically, migration has been for the pursuit of empire building, but there has always been the free flow of people as they moved around in search of work and better life prospects. One of the most central things young people discuss is their future because everything they have been socialised to do – going to school and studying hard – has been in the pursuit of having a good life as an adult. Getting a “good” job after school is considered to be part of building that future. However, in the aftermath of the financial crash of 2007/2008, in which the job market also failed, suddenly a narrative arose in the public sphere that targeted immigrants as being responsible for taking the jobs of British people. That narrative has been around for as long people have been migrating, and during this time of austerity it chimes to the very tune of fear amongst young people who seek work. In using statistics, the realities of immigration can be distorted to perpetuate the belief that a barrage of “Romanians are Coming” in seek of work to send money back as I remember one Channel 4 documentary claiming. Statistics from any source can also be quickly picked up in the press and used to project immigrants as unemployed benefit claimants who are also after British jobs. This feeds into a xenophobic bitterness that can all too easily by adopted by young people. There has been a growing trend towards emigration to Australia and New Zealand where there are better prospects in finding a job, earning a living wage and achieving there. But neither the media nor governments include this in their discussion on immigration. Nor do they mention that a substantial amount of British domestic wealth has come from corporations established out of colonisation and Empire building. Instead, immigration becomes a problem when it moves in the direction of the north rather than the south. In the interest of exercising democratic speech, it is important that UKIP have reopened the discussion on immigration because now other parties can join in the conversation. I think political parties need to change the discourse on how immigration is thought of. Migrants keep the NHS running smoothly and they form the backbone of our globalised financial economy by helping to sustain pensions for the ageing population. Even if there were enough jobs for young British people, it would not be enough to cover the rapidly growing ageing population. Immigration is not the problem blocking the futures of young people in Britain. An economic system that rewards greed and encourages hierarchy is what truly threatens the prospects for young people. 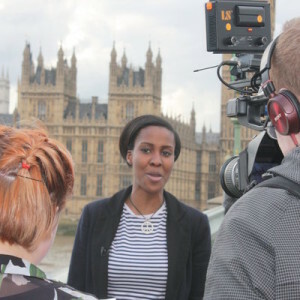 Chineme Ene was a participant in the Sheffield leg of British Future and the Daily Mirror’s Voice of a Generation tour, which looked at what matters to young voters in the run up to the 2015 General Election.